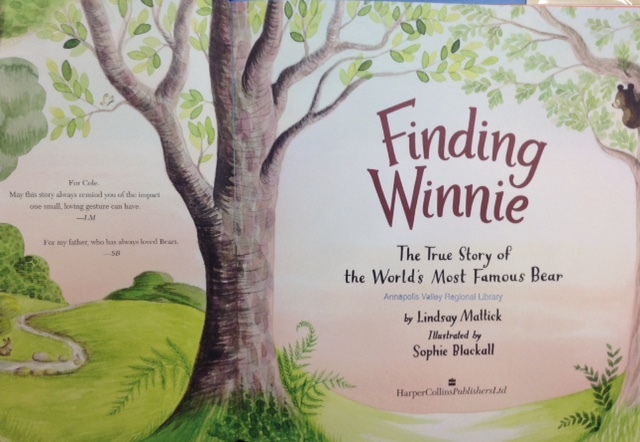 This week I am focusing on one book — Finding Winnie: The true story of the World’s Most Famous Bear by Lindsay Mattick, illustrated by Sophie Blackall, published by Little, Brown, & Company. It is not necessarily a storytime book, but I am smitten by it, so here goes. Look at that cover. The soldier’s leg could be a tree trunk that the little bear is clinging to. 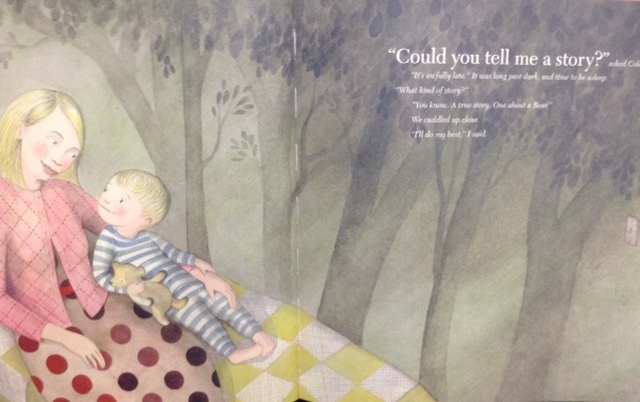 And on the back cover, a teddy bear dangling from a pajama-clad child’s hand– nearly the opposite image, yet connected. Now: move to the end pages. We open the book to the woods. Page turn, and on the title page, the woods view is larger, and there’s that little bear. Page turn, and we are in a room– a room that reminds us of the woods, and maybe a little bit of Max’s room, which turned i nto the woods. And now, it is “Could you tell me a story?” And what a great story it is. Told by the great-granddaughter of Captain Harry Colebourn, this is a perfect story to highlight some Canadian history (which, let’s admit, gets left in the background so very often!). 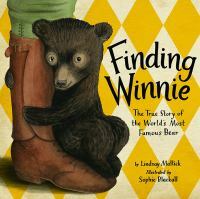 Not only is the story itself endearing, Sophie Blackall’s illustrations make it just, well, squeezable. (Like a teddy bear.) The color palette is just right for the tone of the story, and the page layouts are varied, keeping the visual interest as high as the textual interest. There’s plenty of movement to keep the eye busy, but not so much that it overpowers. I appreciate the differing perspectives, the touching moments that never feel too saccharine, and the wrap up with the family album. And the marching soldiers in silhouette under the paper cover, well that wraps it up nicely for me. Take a look at this book– it works on so many levels. 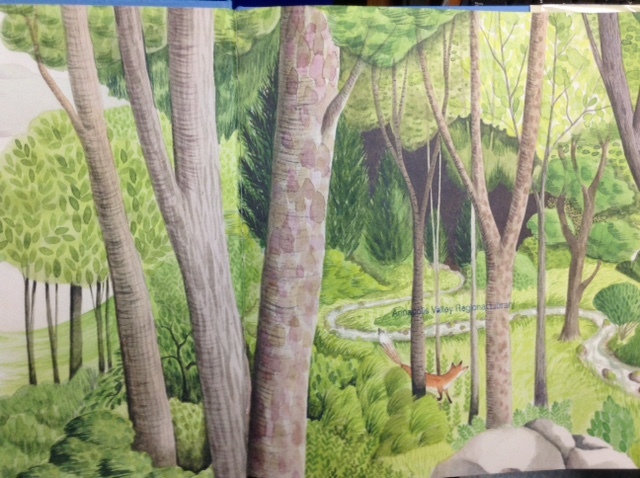 What a beautiful choice to share for Picture Book Month! The year of picture books!